An artist? A calligrapher? In the late 1950s as a Subiaco Academy student, Brother Ephrem had no interest in becoming an artist, or even was aware of calligraphy. He took many courses in high school and in college, learning especially Latin and French in preparation for teaching in the Academy foreign language department. Only about ten years ago did he take advantage of a calligraphy course offered by Lain Stanton, then an employee in the Abbey’s retreat/guest house. 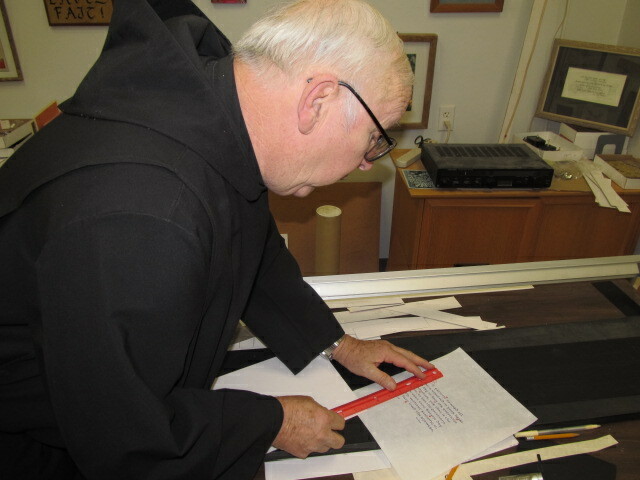 Lain, now Sister Magdalen, OSB, of St. Scholastic Monastery in Ft. Smith, claims that he was her best student, perhaps the only one in those Wednesday evening sessions who still does calligraphy. Br. Ephrem still does calligraphy on a regular basis. He finds it a relaxing and meditative exercise, and also allows him the opportunity to provide pieces for a number of silent auctions, fund-raising events for schools and parishes in Arkansas and in neighboring states. 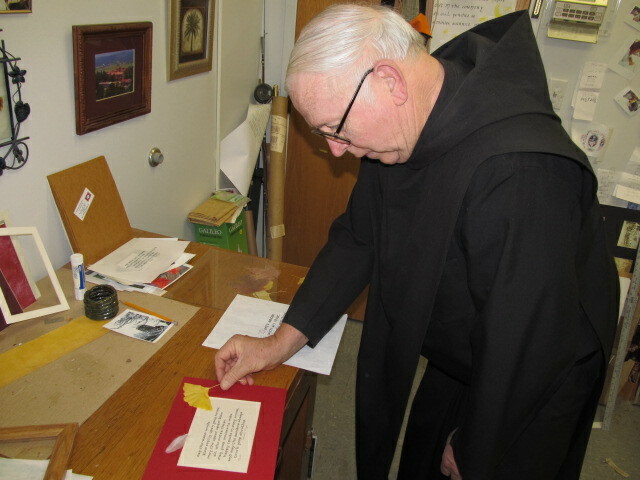 Retreatants at the Coury Retreat Center purchase his works with some frequency. His best “customer” is his older brother’s wife who proudly displays his calligraphy in every room in their home. He begins with a quote, saying, image or photograph that strikes him. Next, he pulls out the stylus and brings to life by ink the image he has envisioned. Once he is satisfied with the color and style, he then begins to examine ways to frame the work with an appropriate matting. If he has been asked, then he also will provide a frame for the artwork that fits the creation. Opportunities to teach others the art of beautiful writing happen each year during the Academy’s Renaissance Days and in classes with the young students at St. Joseph Catholic School in Paris, AR. “Full service” calligraphy might be his motto, since he mats and frames many of his calligraphy works for display, for gifts, and for sale. We wish him well as he celebrates over fifty years as a professed Benedictine monk at Subiaco and looking forward, ad multos annos, to many more years.